Suppliers of the GOE222 extruded aluminium blade. Plus see... 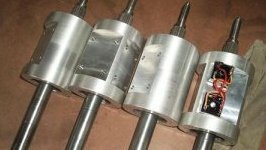 Mounting extruded blades. Phill at Oz Wind Eng has a range of parts for the renewable energy markey, including windmill parts and controllers, hub motors, masts, etc. 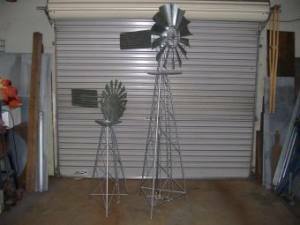 John builds scale model windmills from his home workshop. The larger models have a great deal of detail, and can even pump water. Looking for a good deal on renewable energy products? The Price Watch page lists products found at a good price by our forum members. 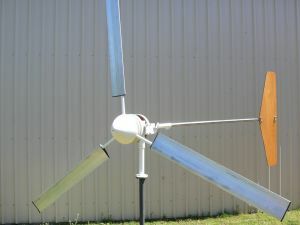 A customized wind generator for every client's application, taking back America one turbine at a time. Hurricane Wind Generators are imagined, engineered, sourced, manufactured, and crafted in the United States. The Back Shed's windmill Kit. The windmill kit I was making is no longer available. While the kit has been successful, my own time constraints with work mean that I can no longer supply the kit. These parts are designed to take a Fisher & Paykel Smartdrive motor as the alternator, the design is not suitable for any other motor. If you have access to a laser cutter, you can download the original laser cutting DXF files below. These files are free and public domain, but there are conditions you must agree too, ie you can not sell the plans, use the files to make your own windmill kits for sale, etc. I have a new design completed now, using common sized steel and a few bits of scrap metal. Click here for instructions. This new design does not need any laser cut parts and is in my view a better windmill. It also uses the F&P Smartdrive as the alternator. But if you have access to a laser cutter you can download and use the DXF file below. Note, these are metric DXF files, if your laser operator requires imperial files, he simply needs to scale them by 25.4. Click here to download DXF files.